Can Raspberries Grow Near Black Walnuts? When to Harvest English Walnuts? A regional product, you likely will not find black walnuts in stores, but if you have a walnut tree in your yard, you can roast the nuts for a more flavorful substitute for English walnuts in all your favorite recipes. Roasting black walnuts follows the same method used for the more common English variety. When sold at farmer's markets, the black walnuts have their hulls removed but their shells intact to preserve their flavor. Once shelled, these nuts grow rancid quickly, so wait until just before roasting to crack open your black walnts. Wrap two or three black walnuts inside the towel. Gently tap the walnuts with the hammer to crack their shells. Open the towel and pull the cracked shells off the nuts with your hands. Repeat with the remaining walnuts, transferring the shelled nuts to a baking sheet in a single layer. Roast the black walnuts for 10 to 15 minutes at 325 degrees or until fragrant and lightly golden. While still warm, rub the black walnuts in a clean towel to remove the skins attached to the nutmeat. Use the roasted black walnuts in any recipe calling for walnuts. Trim branches that you can reach in late fall, a few months after walnuts have fallen. The tree normally will set the bud locations for the next year's nut production a short time after harvest. Cutting these limbs will put the tree's energy into regrowth instead of producing fruit. Apply a fruit reduction chemical to the tree. Spray it on the branches and leaves. Try to get it on as much of the tree as possible. This spray should be applied in late spring before the nuts start to form. Add nitrogen to the area around the tree. According to Jerry Parsons, Ph.D., with the Texas Agricultural Extension of San Antonio, large amounts of nitrogen stimulate leaf and limb growth and lower nut production for the tree. Apply it to the soil in spring each year when the walnut tree would normally set buds and again in summer. Pull a few handfuls of leaves from your black walnut tree. Cut the leaves into ¼-to-½-inch pieces with scissors and put them in a measuring cup. Continue to collect and cut up leaves until you have approximately one quart, or four cups, of shredded leaves. Sprinkle the leaf cuttings around the perimeter of your house relatively close to the foundation without touching the structure itself. Allow the leaves to remain undisturbed for three weeks. Collect the used leaves after three weeks and replace with new cuttings, following steps one through four. Repeat the process every three weeks for maximum effectiveness. Black walnuts are edible, but difficult to find in stores and tough to crack if gathered from a local tree. They are traditionally used in candies, ice cream and baked goods. Put a pair of work gloves on when handling black walnuts in their hulls to prevent the hulls from staining your skin. Hold a black walnut with the hull between the teeth of pliers and tap the hull with a hammer to crack it. Pull the cracked hull off the walnut with your gloved hands and drop the walnut into a bucket of water. Hull the remaining walnuts until all of them are in the water. Swirl the walnuts in the water with your hand to allow the water to remove any bits of hull still adhering to the shells. Pour out the water, leaving the walnuts in the bucket. Scatter the walnuts into a single layer on a wire screen. Set a second wire screen on top to keep birds away from the walnuts. Place the wire screen drying apparatus in a well-ventilated location for up to two weeks until the shells of the walnuts feel dry. Crack the shells of the black walnuts with a nutcracker to access the nut meat. 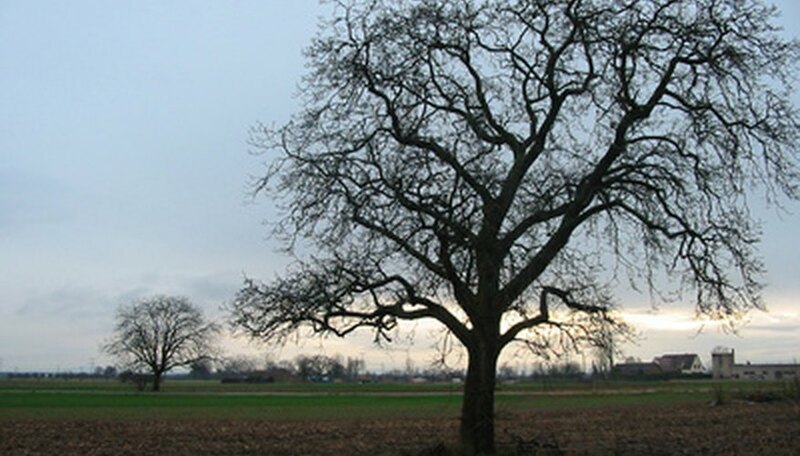 Black walnut (Juglans nigra) trees release a soil toxin called juglone. Many juglone-sensitive plants will not grow properly under--or close to--these trees. Red raspberries occasionally experience wilting or leaf yellowing near black walnuts. 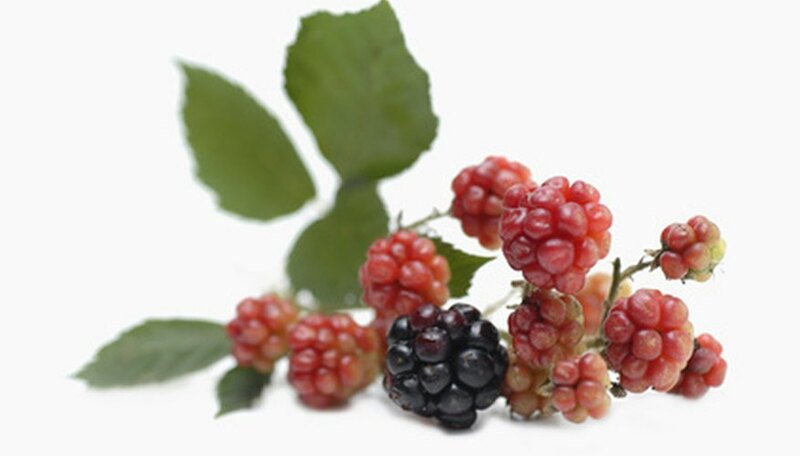 Juglone-tolerant black raspberries, however, remain healthy near them. Figure out if the walnut is ripe by pressing on it with your skin. If they are ready to be peeled, the nuts will show an indentation. Handle the walnuts only with tongs or gloves, since they can stain your hands. Combine three parts walnuts to one part water and a generous handful of gravel in a large bucket. The water will soften the husk so you can peel it off more easily. Vigorously stir the walnuts, gravel and water together with a sturdy spoon for about five to ten minutes. Remove the black walnuts from the bucket. Lay them on a towel to dry. One by one, put each black walnut on a sturdy surface and pound the side with a hammer. Do this until the husk cracks open, then peel it away with your hands. Throw out any walnuts that are oily and black, since these are not edible. Wear gloves or use tongs when handling black walnuts. The liquid from the nuts will stain your hands, which are difficult to remove. Gather the walnuts from the ground when they drop. They usually will drop for about 6 to 8 weeks beginning in the late summer. Place the nuts in buckets to be transferred later or put them directly into garbage bags. Bag up the black walnuts, preferably into paper bags, which will decompose along with the nuts. Throw them out with your regular trash or take them to a local dump that has a yard waste-dumping area. Collect black walnuts from beneath walnut trees in a paper sack. Remove the outside hull by pulling the yellow/brown husk away from the inside nut. Place the nuts in a pillowcase (or other cloth bag) and tie the top of the pillowcase closed. Hit the black walnuts inside the pillowcase with a hammer to break the shells. It is best to do this on concrete, such as a driveway or sidewalk. Remove the walnuts from the pillowcase and pick the nutmeats from the broken shells. Check English walnuts for loose outer hulls and brown tissue forming between the kernel and shell starting at the end of August. Walnuts are ripe and are harvested in the months of September through October, when the outer husk is easily removed from the shell, and the nuts begin to fall from the tree.